Lucas Morel is a Senior Fellow of the Claremont Institute and professor of politics and Head of the Politics Department at Washington and Lee University. Before arriving at W&L in July 1999, Dr. Morel taught at John Brown University from 1994 to 1999. 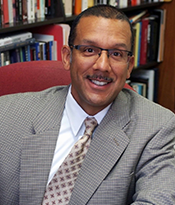 His teaching and research interests are American government, political theory, Abraham Lincoln, and black American politics. He also serves as a pre-law advisor for the undergraduate university at large. Dr. Morel is a board member of the Abraham Lincoln Institute, trustee of the Supreme Court Historical Society, and board member of the Abraham Lincoln Association. In the 2008-09 academic year, he was the Garwood Visiting Research Fellow at the James Madison Program in American Ideals and Institutions at Princeton University. He also teaches in the Summer Masters Program in American History and Government at Ashland University in Ashland, Ohio, where he also serves on the board of advisors. Dr. Morel earned a B.A. in government from Claremont McKenna College, and a M.A. and Ph.D. in government from Claremont Graduate School.